The Largesse of the Sea Maiden is a collection of five stories varying in themes, styles, and lengths. Some were naturally more successful than others, but all were of great quality. The ones that resonated with me most were the three last ones, curiously the atmospheric ones with more somber undertones. Without further ado, I give you my impressions. 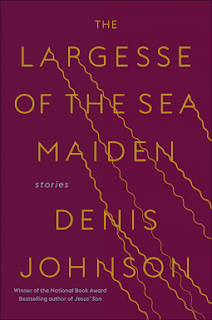 The Largesse of the Sea Maiden is an introspective and vividly described collection of ten vignettes, some short, some longer, around a central character who narrates the stories, and whom we get to know in stages. His name is not revealed until the final story. Starting with the first vignette titled Silences, each successive one is connected to the previous one and occasionally to the one after, by an underlying theme however tenuous. I liked some stories more than others, the longer ones in particular, because they allowed fuller development of the theme explored. Accomplices was insightful and very accomplished despite being relatively short. I laughed out loud reading Farewell and Casanova, and I enjoyed the descriptive passages of New York City's sounds muffled by snow in Mermaid. Written as epistles, Starlight on Idaho chronicles the requests to his support unit (i.e., counselor, doctor, family members), ramblings, and hallucinations of Mark Cassandra, an alcoholic in rehab at the Starlight Rehab Center—used to be the Starlight Motel on Idaho Avenue, a seedy neighborhood—in Ukiah, Northern California. Mark, signing as Cass, addresses the "people who have hooks in his heart", telling them what his life has been like in the last four years. He also retells the deeds of his family members, and the testimony of some fellow addicts in his therapy group whom have left deep impressions on him. At times difficult to read due to the topic and syntax, but always with a good dose of dark humor, Starlight on Idaho is an authentic attempt to decipher what goes on in the head of an addict who has been through Hell and wants to amend his ways. Among the twenty or so inmates at a county jail, there is a man nicknamed 'Strangler Bob', in for a shocking crime for which he may easily get twenty-five years in prison. Knowing a thing or two about criminal behavior, he makes an unexpected prediction about three very young, small-time criminals while they are high on drugs—obtained through a contraband magazine. My favorite story in the collection, and the most successful by far, both in tone and narrative, Strangler Bob showcases dark humor courtesy of an ensemble of crooked characters in a county jail. Unexpectedly philosophical, and with an ending that has a ring of karma, Strangler Bob is a refined study on human nature regardless of station in life, seen through the lens of social outcasts. In sort of a writing exercise, a nameless writer details in his journal his experience as a caretaker for two of his friends—one of them until his final breath—, and other family members. After surviving so many close encounters with death, he feels that, at least for now, he has gotten the upper hand. Triumph Over the Grave is a longer story than its predecessors in this collection, more like a novella really, somber in topic yet compulsively readable. In it, nature (e.g., vultures, a windswept Texan prairie, and a stormy night in California) plays a major role, as it effectively contributes to the mood and atmosphere of the story. Triumph Over the Grave is a quiet meditation on death, and on temporarily winning over death. Writer and professor of poetry, Kevin Harrington, meets informally after class his most talented student. Marcus Ahearn, a young, adrift poet, has a secret obsession with Elvis Presley—and his fate after 1958—fueled by the death of his charismatic brother. Both Kevin and Marcus meet over the years to discuss whatever Marcus has been able to dig out about Elvis Presley’s twin, who was supposedly stillborn but whom Kevin argues not only survived but usurped Elvis’ life after the singer was killed by his manager. With the length of a novella, an intriguing mystery/conspiracy theory, and characters one cares about, Doppelgänger, Poltergeist is my second favorite story in the book after Strangler Bob. Not only is the mystery intriguing but well developed, thus one feels fully immersed and wanting to know more about what could have happened to young Elvis. Did Elvis become mediocre as years went by, under subpar management, or was the reality more sinister? Whatever the answer I was hooked. The ending left me in sort of “what?” state; I think it was so open that it baffled me, something that usually happens to me with open endings. In spite of that, I think the story was successful enough to end the book in such a high note that made me grant it half stars to its already four solid rating. 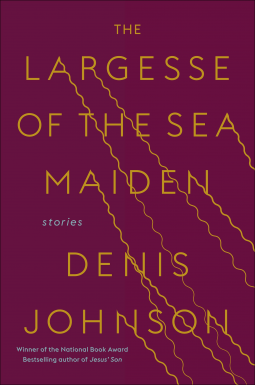 After reading the last three stories whose underlying themes are of death, and knowing that The Largesse of the Sea Maiden is the last book Denis Johnson wrote before passing away not that long ago, I wonder if he saw his end near and wrote about its meaning and transcendence. Whatever the case, in doing so Denis Johnson left us with a collection of short stories that is introspective, meaningful and lofty. I seldom read collections of short stories, but this one certainly sounds like it would be worthwhile. It is. I used to read a lot of short stories collections in my younger years, but not so much lately. I was offered this one for review and I took a gamble that paid off; I rediscovered my love for short stories. First off, your review is wonderful, so thoughtful and well written. I have always been curious about this author because he is so revered by other writers. Now I am moved to read him. I first loved short stories by reading the ones in magazines, not the ones we had to read for school. I read all the stories in my mom's mags and in Seventeen and Mademoiselle. They seemed full of life and reality to me. When magazines stopped publishing stories I stopped reading them much. I got hooked on novels and stories always seemed too short for me. So for you to say that you discovered your love for short stories really struck me. Perhaps I was reading the wrong short story writers. Thanks, Judy. I, too, grew up reading mostly short stories, not from magazines but the ones by Edgar Allan Poe, Oscar Wilde, Raymond Chandler, Arthur Conan Doyle, Gabriel Garcia Marquez...I read lots of short stories collections by masters of mystery/suspense genre, plus Russian folk tales and the usual fairy tales for children. I bet, in retrospective, I read more short stories than novels growing up, but eventually I made the transition to novels and never looked back. Perhaps looking forward I won't read them as often but I won't snub them either. I have to say that this was a chance that I took with this book because I accepted it based solely on critics' buzzwords, something I normally don't do, but as I found out, at least with this collection, is that it is best to approach it as blindly as possible to avoid being colored by prejudice. It sounds like a worthy story collection. I have not read Denis Johnson before but have heard his books much talked about over the years. It is sad he has passed away and that he seems to have written some of these stories knowing that he didn't have long. Perhaps this book might be his most introspective b/c of that. I'd like to read his thoughts with these. Nice review thanks. Thanks, Susan. It is a worthy collection. I don't know the circumstances of his passing but either he foresaw his death and wrote this collection with that in mind, or he was sick for a while and that allowed him some time to explore that angle in this final work. Either way, I want to check out the rest of his works to see if they have the same intellectual height that he reached with this final one. I never used to read short story collections but I've found myself reading them more often over the last few years. I'm not sure this particular collection would be for me, but I'm glad you enjoyed it. It does sound like an interesting and meaningful book. I have seen your reviews of several short stories collections and in part that inspired me to take the leap, so thank you. I know this collection is not for everyone, but the humor made it endearing. I don't tend to read a lot of short story collections but I think that ones like this - where they're linked - work really well. I'll keep a note of this one. Yes, Lynn. The interconnectedness of the stories in theme and sometimes characters worked really well; I liked that. I don't read very many short stories, but this collection sounds really interesting! It is. I enjoyed it immensely.